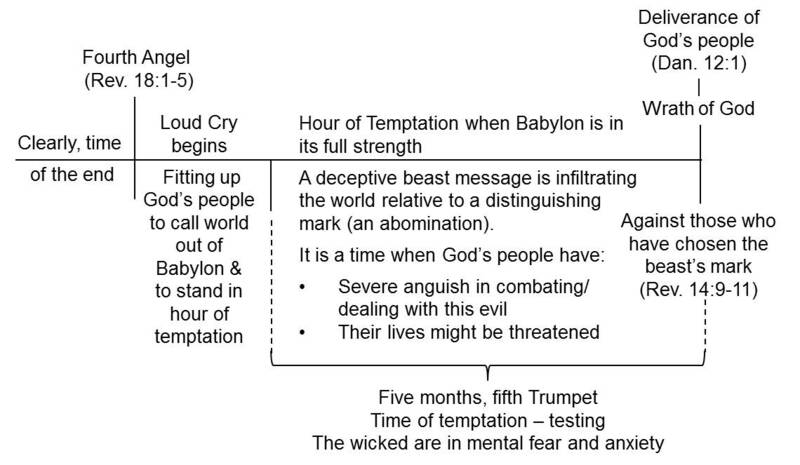 EndTime Issues ... : "The Hour of Temptation"
The student of Revelation is early on moved into an amazing Christological view that is high and elevated. Everything collectively, in turn, is how Jesus wants to be seen as John’s apocalyptic narrative is progressively studied. “‘To the angel of the church in Philadelphia write: These are the words of him who is holy and true, who holds the key of David. What he opens no one can shut, and what he shuts no one can open” (Revelation 3:7 – NIV). “Holy and true” – Christ is called the Holy One of God (Mark 1:24, Luke 4:34). There, His deity is introduced. In Revelation 6:10, He is addressed as “sovereign Lord” (NIV). The word here for “true” is alethinos, meaning genuine, faithful to His promise. Together: “I’m a divine being who keeps His promises!” He is actually about to give this people a profound promise! Christ, here, states that He has assumed authority over David’s (God’s) kingdom. Jesus is also the Lion of the Tribe of Judah, root of David, the offspring of David who came from his tribe (Revelation 5:5, 22; Luke 1:32). He now has the key to the kingdom door. He controls who enters. No one can change His decisions. Through His judicial eyes (1:14b) He announces, “I know all about you.” Amazing – one would think that Christ would follow this up with penetrating details! But rather comes this statement of wondering awe. “I have set before thee an open door, and no man can shut it.” That’s the promise! The door to His kingdom has been opened to the people of this church! Something holy and sanctifying must be going on with this group! Of the four characteristics, “little strength” (weakness) seems to stand out as a negative. This, however, turns out to be an uplifting quality! “But God hath chosen the foolish things of the world to confound the wise; and God hath chosen the weak things of the world to confound the things which are mighty” (I Corinthians 1:27; cf. II Corinthians 12:9). Stunning! Though weak, their witness was strong. Their missionary zeal later influenced the Christian church to expand beyond the European frontier, even to Africa and, later, to the Americas! This group is unique among the seven churches! It will later be shown that they have characteristics similar to the 144,000 in the 14:1-5 discourse! Within the Philadelphia community were a group of dishonest Jews from which Christ disassociated Himself. This was so profound that He called them the “synagogue of Satan” (as He did a group in Smyrna – 2:9). They were ethnic Jews who claimed to be the true Israel. But Christ’s words are pointed – they aren’t His. They denied that Jesus was the Messiah and persecuted those who believed that He was. This reflects the ever-widening gap between Judaism and Christianity. The latter anticipates that “every knee will bow” (Philippians 2:10-11; cf. Isaiah 60:14) in humiliation, acknowledging Christ as the Messiah! These Jews represent those who vehemently oppose Him as Savior. In Nebuchadnezzar’s day the three worthies were to bow down to that great golden image (Daniel 3:6, 11). In the wilderness Satan offered rewards to Jesus if He would bow down and worship him (Luke 4:7). Here, the Jews wanted the Christians to bow down to their traditions. However, Jesus said that they will bow at the feet of those saints at the end. This has profound future implications. At the end there will be those claiming to be His who try to force a non-Biblical “tradition” on God’s people. Finally those apostates will see that they were wrong. Christ promises in this mini-prophecy that the saints will be at last acknowledged and vindicated – even by their oppressors! In turn, God’s character will be vindicated! “The Philadelphia Factor” is now addressed! This is another promise that will come to pass because of their patience (later associated with the saints (14:12) and echoing those who traverse to and through the 1335 days at the end (Daniel 12:12). It is referenced elsewhere as will be seen as this study unfolds. This stressful hour begs Christ’s prayer for the saints: “I pray not that thou shouldest take them out of the world, but that thou shouldest keep them from the evil” (John 17:15). There is a broad and divergent understanding of the meaning of this “hour of temptation.” Among scholars there are many explanatory assumptions. The word for “temptation” is peirasmos. It is a period that judges humanity’s final reaction to the enticement of sin. It is the last “testing time” to see where everyone’s loyalty lies. The wicked world will even put God to the test during this time. With this fascinating insight, one can conclude that this occurs as time is running out. Probation is about to close. It’s a very end-time issue. This is “the” separation experience when the world is divided into two parts forever! What, then, might this “test” – “temptation” – “enticement” – be? The “abomination that leads to desolation” is presented by Christ and Daniel as a defining issue (Matthew 24:15, Mark 13:14, Daniel 12:11, 11:31). 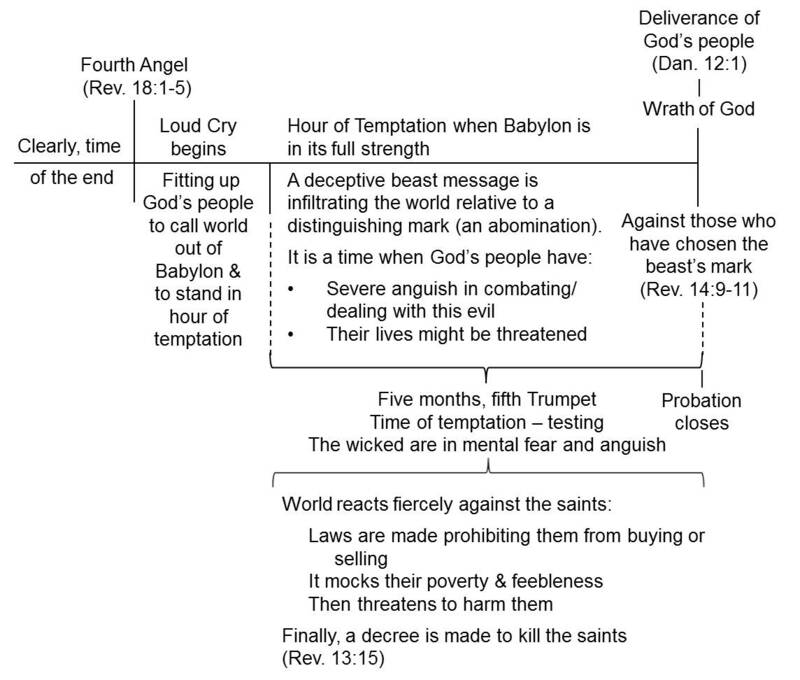 In turn, that is related to the mark of the beast (Revelation 13), where terminus ad quen issues are given. Here we penetrate deeper by appealing to the insights of expositor White. She used this phrase in many of her narratives. One can grasp a profound meaning in this “Philadelphia factor” when corroborating several quotations. “Just before us is the ‘hour of temptation, which shall come upon all the world, to try them that dwell upon the earth.’ All whose faith is not firmly established upon the Word of God will be deceived and overcome.” Claiming a loyalty to Christ will not be enough. Faith indelibly fixed on Biblical truth is then required. Following E. G. White’s counsel, one must study and know about this hour! The imagery suggests the time discussed in Revelation 13:7a, 13-17. “And he [earth beast] had power to give life unto the image of the beast, that the image of the beast should both speak, and cause that as many as would not worship the image of the beast should be killed” (Revelation 13:15). “The papal power has thought to change the law of God by substituting a spurious Sabbath for that of Jehovah; and all through the religious world the false Sabbath is revered, while the true one is trampled beneath unholy feet. But will the Lord degrade his law to meet the standard of finite man? Will he accept a day possessing no sanctity, in the place of his own Sabbath, which he has hallowed and blessed? No; it is on the law of God that the last great struggle of the controversy between Christ and his angels and Satan and his angels will come, and it will be decisive for all the world. This is the hour of temptation to God’s people; but Daniel saw them delivered out of it, every one whose name is written in the Lamb’s book of life.” (Daniel 12:1). What severe time comes to the “whole world” (when the saints are protected) before God finally steps in with the seven Vials? During a five-month period Satan has full reign to evangelize evil (just as God’s people will have full reign to witness under the Latter Rain) (Revelation 11:5-6). This is the “final standoff” between good and evil. This is apparently when the decree will go out to kill all the saints at a predetermined time (just as it happened in Esther’s day)! Important to recall that by then the first four Trumpets have begun their destructive work. Riveting this is another thought from E. G. White, addressing this time as one of deception – the hallmark of the fifth Trumpet. Wonderful is the thought that through this difficult time comes the comforting power of the Latter Rain to the saints. The wording in verse 10 does not imply that God’s people will be protected from any kind of trials, but within the trials God provides special strength. In its deepest sense, it is an assurance of spiritual protection through the strength God provides. The false prophet, which best applies to the United States, reaches a point where it lashes out at God’s true people through oppressive laws (Daniel 11:31, 12:11). Virtually everything noted in expositor White’s thoughts above are an affirmation of Biblical prophecy! Lest there be any question as to what time this Philadelphia era refers to, Christ again draws on this as an eschatological theme. Why was this church promised a rapid return of Jesus? The whole message is end time. Even more, referring to the whole book, a similar appeal and setting are noted in Revelation 1:1, 3 and 7 collectively! Here is the key: In the context of this prophecy (even the Book of Revelation) being fulfilled, Christ’s coming is expected. The “crown to hold fast” is not a kingly one but a crown of victory. “Jesus tells the church of Smyrna that if they are faithful unto death, He will give them a crown of life. Here the Philadelphians already either possess the crowns [figuratively] or already have one ‘reserved’ in heaven. At the end of his life, Paul told Timothy, ‘I have fought the good fight, I have finished the course, I have kept the faith; [in the future] there is laid up for me the crown of righteousness, which the Lord, the righteous Judge, will award to me on that day; and not only to me, but also to all who have loved His appearing.’ 2 Tim 4:7-8. In either event, it is clear that they have already overcome the beast and his image. However, they are cautioned to hold on to their faith and their relationship with Jesus, implying that they could still lose salvation.” Probation still lingers. How might one lose his/her crown? Many will fall by the way – never to return. The word for “pillar” means a prop or support. Some of the disciples were pillars (Galatians 2:9). The implication here is that these individuals will be special representatives in support of that heavenly kingdom. These individuals, the church, will remain forever a part of the “temple of God” – the very spiritual center of the universe! Amazing! Christ now gives special promises to this church. This is like a marriage vow, becoming unified with the heavenly family with “seals” of belonging on their foreheads. Christ’s new name – a mystery in waiting. This will be the name of the groom! “His eyes were as a flame of fire, and on his head were many crowns; and he had a name written, that no man knew, but he himself” (Revelation 19:12, 22:3-4). “And there shall be no more curse: but the throne of God and of the Lamb shall be in it; and his servants shall serve him: And they shall see his face; and his name shall be in their foreheads (Revelation 22:3-4). “And I looked, and, lo, a Lamb stood on the mount Sion, and with him an hundred forty and four thousand, having his Father’s name written in their foreheads” (Revelation 14:1). It will be all those translated at His coming. “He that hath an ear, let him hear what the Spirit saith unto the churches” (Revelation 3:13). Jesus concludes: Hear, listen, know, what God’s Spirit teaches regarding this church. What a privilege to comply. When “delivered,” that “Philadelphia factor” will be history! Philadelphia – the 144,000 plus (another deeper study). Beale, Gregory K.; The New International Greek Testament Commentary; The Book of Revelation (William B. Eerdmans Publishing Company, Grand Rapids, Michigan – 1999), p. 283. Stefanovic, Ranko; Revelation of Jesus Christ (Andrews University Press, Berrien Springs, MI; 2002), p. 139. Naden, Roy C.; The Lamb Among the Beasts (Review and Herald Publishing Association; Hagerstown, MD; 1996), p. 85. Doukhan, Jacques B.; Secrets of Revelation (The Review and Herald Publishing Association; Hagerstown, MD 21740; 2002), p. 41. Johnson, Alan F.; Revelation, p. 514, from Gaebelein, Frank E. (gen. ed. ); The Expositor’s Bible Commentary, vol. II (Zondervan, Grand Rapids, MI 49530; 1981), p. 453. Stefanovic, op. cit., p. 141. Beale, op. cit., p. 290. Friberg Lexicon (cf. Hebrews 3:8). White, Ellen G.; This Day with God, p. 114 (emphasis added). White, Ellen G.; The Great Controversy, pp. 552, 560 (emphasis added). White, Ellen G.; The Faith I Live By, p. 286 (emphasis added). White, Ellen G.; Spiritual Gifts, vol. 1, p. 162 (emphasis added). White, Ellen G.; The Signs of the Times, January 17, 1884 (emphasis added). White, Ellen G.; Spiritual Gifts, p. 193 (emphasis added). White, Ellen G.; Last Day Events, p. 182 (emphasis added); cf. 21MR68, RH 6/7/1887. White, Ellen G.; The Great Controversy, p. 560 (emphasis added). White, Ellen G.; Spiritual Gifts, vol. 1, p. 96 (emphasis added). Osborne, Grant R.; Revelation (Baker Book House; Grand Rapids, MI), pp. 192-194. White, Ellen G.; Christ Triumphant, p. 366. White, Ellen G.; Maranatha, p. 209. Osborne, op. cit., p. 193. Canter, Bryan; Revelation, Part 2, Messages to the Seven Churches (Prophecy Research Initiative document – 2002), p. 19 (emphasis added). White, Ellen G.; The Spirit of Prophecy, vol. 4, p. 426.